Fourside is a location in the EarthBound series located in Eagleland. It also appears as an unlockable stage in Super Smash Bros. Melee. 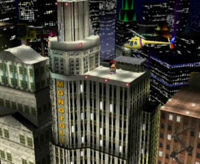 The stage is set high on the skyscrapers of Fourside. Players have to be careful not to fall into the gaps between the buildings. The stage has a crane on the left side of the stage which is holding a wooden board. Occasionally, the board will be moved over the gap on the side, and players can fight safely on top of the gap. The UFO is an unidentified flying saucer from the EarthBound series. It will randomly appear on the far right or far left side of Fourside, and offers another platform for the players to fight on. However, the surface of the UFO is very slippery, and players have a hard time using their characters on the platform. After a prolonged period of time, the UFO will disappear, presumably because of a teleportation device. After a while, the UFO will re-appear, and players can yet again fight on top of it. The stage can be unlocked by playing 100 matches in VS mode. Fourside reappears in Super Smash Bros. Ultimate, with an updated design. 6/95 At the beginning of EarthBound, this flying saucer appears along with the ominous message, "The War Against Giygas!" Adding to the mystery are three more UFOs while fly amok in the skies over Onett; how all of these alien craft are connected is anyone's guess. In Super Smash Bros. Melee, this slippery UFO appears on the Fourside level. Coincidentally, the city shares the "Big Banana" nickname with New Donk City in Super Mario Odyssey. Despite being called Fourside, the stage in Super Smash Bros. Melee resembles a combination of Fourside and Moonside. This page was last edited on December 10, 2018, at 22:55.